Anxiety Disorders: The Go-To Guide for Clients and Therapists pulls from a vast array of treatment modalities and lifestyle practices to offer you a rich compendium of healing opportunities for the treatment of anxiety disorders. With The Guide in hand, you will be able to understand not only what treatment options are available, but what might fit best for you as a client or as a therapist. The treatment of anxiety disorders cannot be simplified into a one-size-fits-all model. If you want a clear-cut explanation of Generalized Anxiety Disorder, Panic Disorder, Specific Phobias, Social Anxiety Disorder, and Obsessive Compulsive Disorder, The Guide is the place to begin. If you want to gain an understanding of how to craft the best treatment plan that reflects your individual needs, The Guide is a springboard for your creativity. Daitch has written an exceptionally clear and multi-faceted consideration of anxiety disorders and their treatment. Her kind tone is matched by her clinical skill, as she engages her intended audience of both therapists and people suffering with anxiety issues. She teaches readers that anxiety has multiple causes and multiple treatments, and liberally sprinkles the text with examples and potential paths to recovery. This really is the guide to go to! 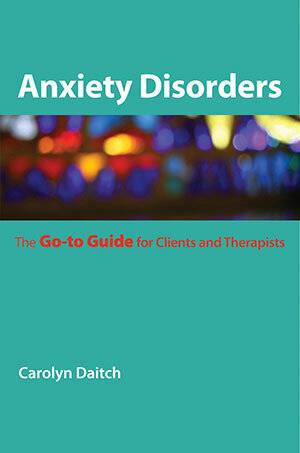 In this easy-to-read guide, Daitch has provided a compendium of information about what works for anxiety disorders. She guides readers through the maze of varied symptoms and available treatments to the center of what they need, revealing methods that really work to calm panic, ease worry, reduce compulsiveness and eliminate phobias. Daitch’s Go-To Guide will be welcomed by therapists and consumers alike. This book is a gem. It’s a rich compendium of tools, techniques and professional wisdom for both clients who suffer from anxiety disorders and the therapists who treat them. I commend Dr. Daitch for this invaluable resource.